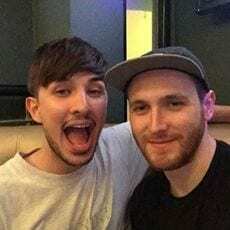 On the 8th April 2018, Alastair Bealby and Neil Bryne, will be taking on the Manchester Marathon in memory of their friend Martyn Hett, who tragically passed away in the Manchester Attack in 2017. “The hashtag #BeMoreMartn is why Neil and I want to pick up the baton and keep running to try and give something back. It’s one way in which we’re trying to make Martyn’s legacy live on”. Aiming to raise £1,800, the pair have chosen to donate the proceeds to Kidscan Children’s Cancer Research, a charity that Martyn supported. “Martyn was the most hilarious and fun-loving person I’ll ever know and I miss him dreadfully every day. He was a deeply loving and caring person, who had a big personality and a big heart who worked passionately in support of Children’s Cancer Charity, Kidscan. It was only right that I carried on supporting Kidscan as it was a charity that was very close to Martyn’s heart”. Previously, Alastair ran in the Munich half marathon in memory of Martyn, where he managed to raise £1,800 for Kidscan. Alastair added “Cancer can rob children’s lives and cause the same grief and pain for families. That’s why I’ll keep running to make money for Kidscan”.